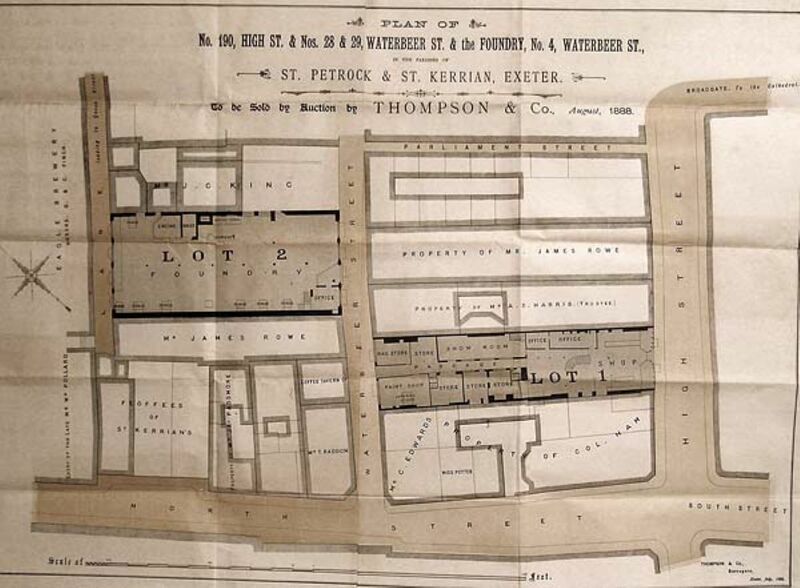 If you have read the History of the Company you will realise that for hundreds of years the business traded in Exeter's High Street but we have no sketches or paintings of the premises; it has only been in the last 150 years or so that we have the benefit of plans, drawings or photographs. The premises in High street, although still in existence (2010) as McDonalds has changed considerably over the years and we can work our way back to when F.W. 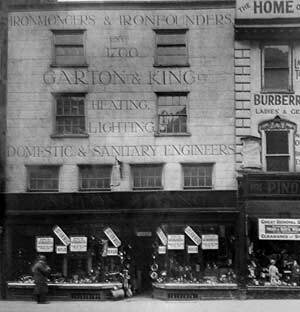 Woolworth & Co moved into 190 High Street with its newly re vamped exterior in 1934. 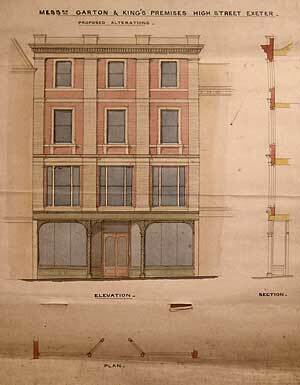 We have photographs of the premises from around the early 1900s and we also have included one of the architect's drawings of a proposed new exterior and shopfront from the middle 1860s from the Firm's archives. 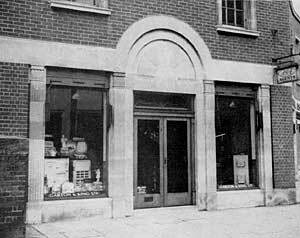 In 1933 the premises at 190 High Street was closed and a much reduced Ironmongery Department was transferred to the Waterbeer Street premises. The Waterbeer Street Premises was a most interesting building and here I have reproduced extracts from my fathers recollections and photographs of the interior (when being demolished) are included in this Chapter. A film of the foundry and Waterbeer Street was made by my father in the late 1930s. See Garton and King Film. 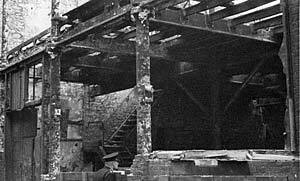 "The old Foundry was a remarkable building. 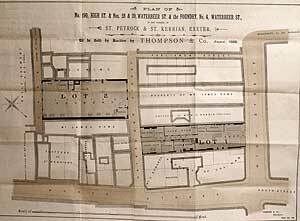 It presumably had been constructed or extensively repaired after the fire in 1826. 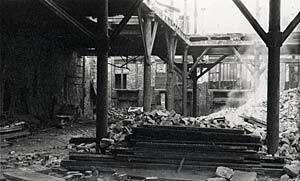 It consisted of brick arch cellars into which material (scrap iron, pig iron, coke etc) could be discharged either from Waterbeer Street through ground level openings, or in the rear of Trickhay Street. The ground floor was slightly raised about 2ft above street level and comprised the foundry sand floor for moulding, the cupola being centrally placed with its back to the yard on the East Side. Against the west long wall were six brick based forges for blacksmiths with chimneys for each extending the whole height of the building. The second floor was a timber one carried on wood joists with oak main beams about 30" x 18" section and well seasoned so that you could only drive a nail in perhaps half an inch. This floor was originally used by the whitesmiths, making tinned iron, copper, tin vessels, also leadwork, etc. In 1920 - 1930 there was a plumber and a tinsmith. On the West side was a long thick and ancient bench on which had originally stood the five or six small braziers in which the heated their irons for soldering or pots of lead for wiping joints. 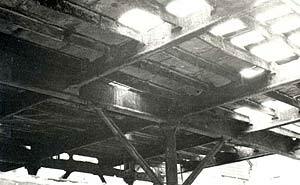 Then above the second floor was a roof space, into which had been put patterns not in general use. 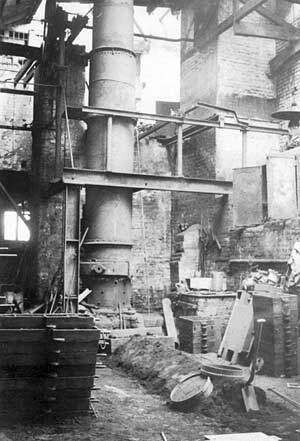 I think the pattern maker also used part of the second floor, where we also had lathes and drills, which were used by the smiths and one turner. The blower for the cupola was originally driven by a gas engine, which, with shafting and belts and pulleys also drove the lathes, drills etc. (See the "ODDITIES" Page). By the 1920s electric motors provided the power. At the Waterbeer Street end all floors had opening doors to enable the hand crane - chain type - to unload items from the street to each floor, the crane mechanism was in extended roof space also with opening for verbal instructions from below. When the foundry was melting metal, the smoke from the cupola occasionally descended like a fog in the High Street, or Waterbeer Street or the Guildhall, but as we had been there almost as long as the Guildhall we got away with it, especially as there were no detailed environmental Laws on the subject. The cupola was, of course, hand filled from a stage with a hand crane, later electric, bringing raw materials up from the cellars to the loading platform. The following may be of incidental historical interest. 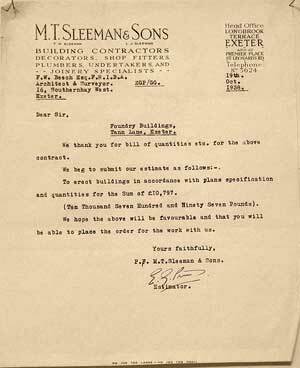 "The removal was interesting in that we had asked several to quote, including the Great Western Railway, who proved considerably cheaper. They did this by having a petrol motorised 3 wheel colt to which the could attach trailers, and also using horse drawn flatcarts. The point was that for many items the time involved was mostly for loading and unloading, so the mechanised unit could serve three trailers, two loading / unloading and one in transit, and while the carts took longer for the journey the cost of standing time was so much less it saved more than the extra time in transit, also the uphill part was with the cart unloaded." In addition to the New Foundry a Showroom was establish in the rebuilt Queen Street Station, renamed Central Station. 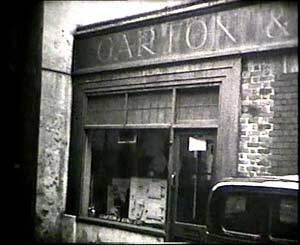 After the War the show room relocated to premises bought in North Streeet, No 19 and it is there that the successors to Garton & King trade to this day. On an Archaeological note, the rear of 19 North Street was excavated by Exeter Archaeology in 2005 and copy of the Report 06.07, EA Project 5448 published in February 2006 is available for viewing on application to Exeter Archaeology, Bradninch Place, Gandy Street, Exeter. A final point of interest. 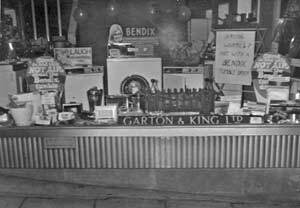 Between roughly 1935 and 1948 (and maybe into the 1950s) Garton & King operated a "Branch Office" in Truro, Cornwall. The address was 2 Calenick Street, the telephone number was Truro 3040. I have visited the location and tried to find out further information but with little success. I have no idea how many staff were involved, I understand a fitter was based there in order to maintain a 'presence' in Cornwall. The property was demolished in the 1960s and, being in somewhat of a backwater and not the most photogenic district in Truro I have been unable to track down even a photo of the premises - anyone who can shed light on this 'Outpost of the Empire' please contact me. During this period the word TRURO appeared on many castings, and the purpose of the Truro branch was to encourage Cornish business. See The Gully and Drain Covers. The illustrations below show the premises from the 1860s to the 1980s. Two artists drawings show plans for the improvement to the ouside of 190 High Street but it seems internal alterations took preference and neither of these proposals came to full fruition. The front view of the High Street shop shows the Golden Hammer hanging above the shop doorway. Up until 1907 the Royal Arms had been on display. Illegally as it appears as correspondence exists between the Secretary of the Royal Warrant Holders Association, a Mr S. K. Holman, and Garton and King relating to this matter. It appears the Royal Arms must be removed after a certain period of time after the Royal Personage's death. Abrupt instructions were given to the Landlord of the premises to remove them "At Once". (at the time this was the late Mr King's wife who had moved to Bournemouth). One of the proposed alterations - 1869. 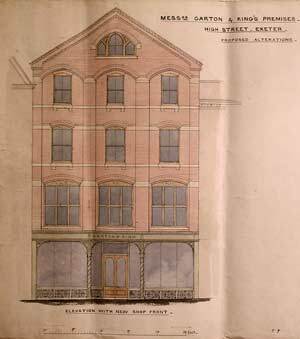 The alternative proposed alteration to the shop front - 1869. Photo of the shop in the High Street in 1907. The view of the old cupola was taken when it was active in 1935. The 3 slightly blurry pictures are still from the cine film my father took just before the war, The chimney view shows Mount Dinham Church in the distance and close examination of the 1888 plan shows the corresponding locations of the forges at ground floor level. The Crane viewed in the second picture is referred to above in my father's notes; the last still is of the Back Shop, the Foundry Shop in Waterbeer Street - maybe the vehicle is the Company Car which will feature in a future article on Transport and the Company. The new premises in Tan Lane was finished and was operational by late 1939 - an aerial view of the new premises can be found in Chapter 7 of the History of the Company. 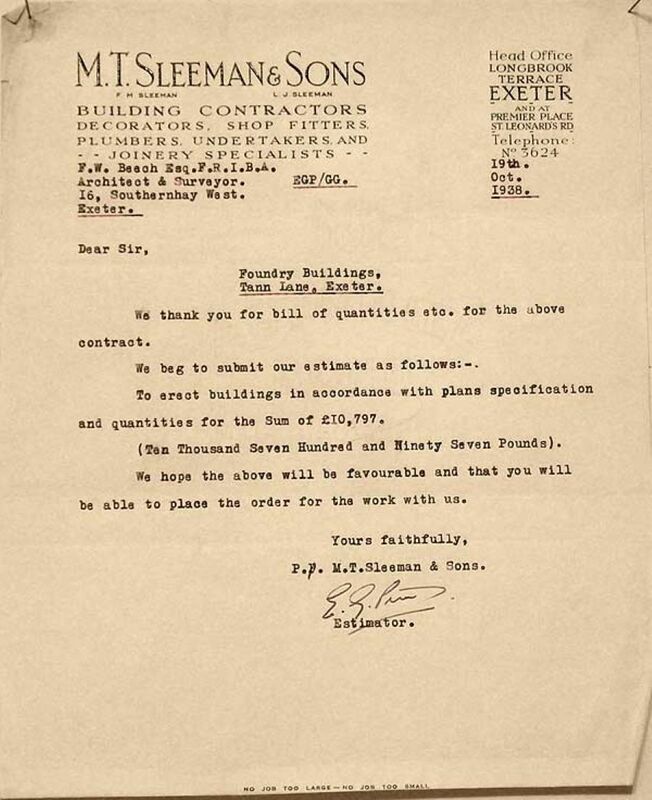 It can only be surmised that Sleemans were the Contractors who built the new foundry - if anyone viewing this site has in anyway researched this long established Exeter Builder they may be able to provide proof positive of this and I should like to hear from them if this is the case. Front entrance to the foundry from the 1936 film. 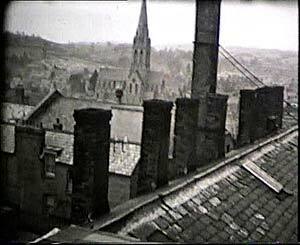 View from the roof, from the 1936 film - St Michael's Church in the background. 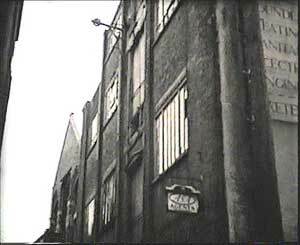 The front of the foundry in Waterbeer Street from the 1936 film. Whether the Central Station premises were moved into just prior to the Second World War or not I do not know - as a boy I remember the showroom being there although I was probably more interested in the Steam Trains on the Southern! The next three pictures are able to be displayed thanks to the Westcountry Studies Library. They are from a series of 35mm photographs taken by a Mr R Roberts of the foundry probably about 1963 though his notes are dated 1976. I have no idea who Mr Roberts was, where he lived and whether his interest in the structure of the building that its demolition revealed, was amateur or professional, he might have been a local historian or involved in industrial archaeology - perhaps someone reading this knows. By 1964 the premises had been demolished as part of the Guildhall Redevelopment but these (and other) photographs fortunately tie in nicely with my father's description above. Looking north. The infilled arches are on the west wall. The last two photos refer to 19 North Street - this is where the new showroom was located at the end of the lease for the Central Station site. The gentleman in the photograph is of Mr Alec Holladay, my Uncle, who, with the able assistance of his son Michael, and others ran the Showroom up until his retirement. Alec Hugo Holladay - circa 1980. The shop window in North Street. Thus we come to the end of this somewhat lengthy Chapter; to follow will be smaller articles on the Transport G & K used over time, a short article on the notepaper and printing and the rubber stamps used by the Company and information on the staff, timesheets, social activity and information on the terms of apprenticeship, particularly in respect of a former Taylor and Bodley employee. Do I hear a deathly hush!